The latest addition to Chattanooga's greenway system is by no means the longest we've completed. 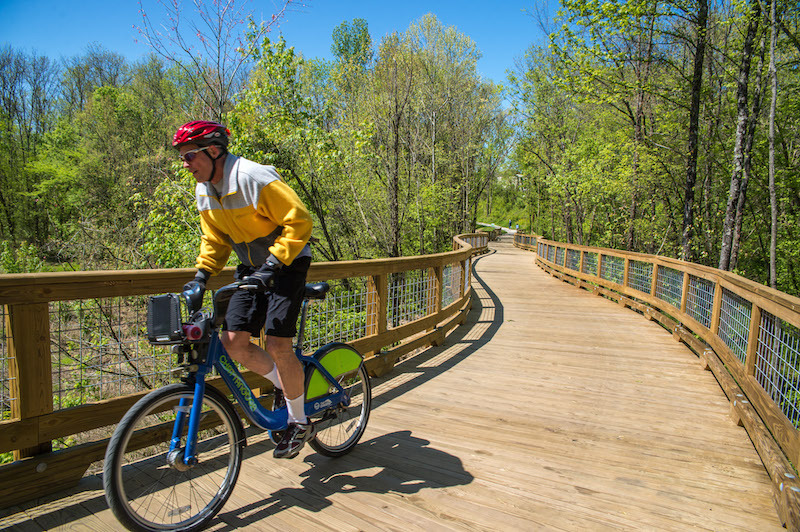 But if you ask the neighbors who turned up for the grand opening, they'll tell you this stretch of trail's got something that matters more than mileage: a bridge, linking the South Chickamauga Greenway to the Tennessee Riverwalk. 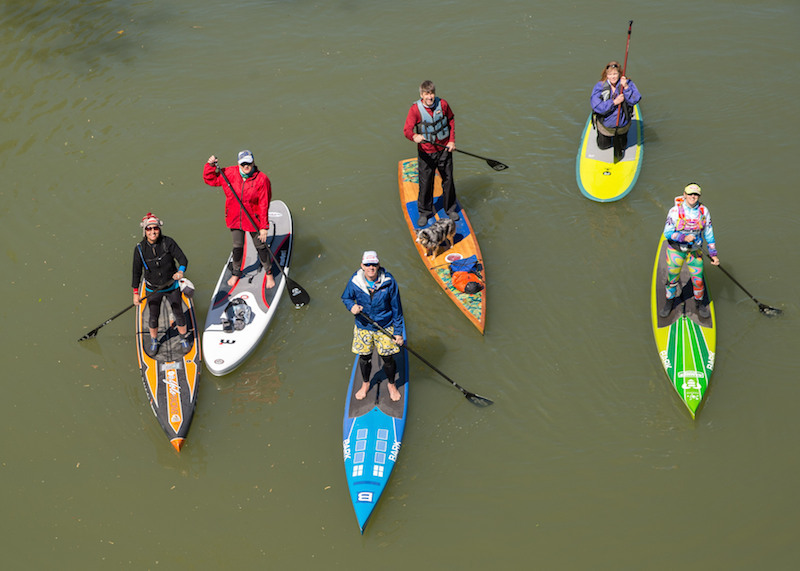 At a community celebration last month, Chattanoogans turned out to mark the marriage of the greenways with a 5k race and a stand-up paddleboard social—as well as a bike parade, bluegrass, and dancing. "It's been 20 years in the making," said Rick Wood, The Trust for Public Land's Tennessee state director. "Now there's true connectivity into neighborhoods. This is a big deal." Longtime resident Walter Hodges, who lives adjacent to the new trail segment, agrees. Before, if he wanted to use the Riverwalk, he had to drive to it. 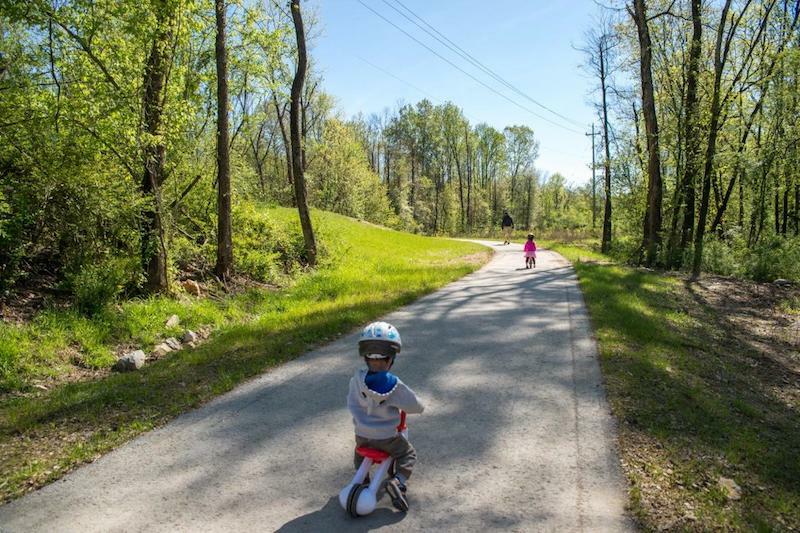 Now, he's among the 25,000 people who live within a 10-minute walk of the South Chickamauga Greenway—so he can get there on foot or by bicycle. “My family can now ride from our home near Sterchi Farm to the downtown area, staying on the greenway entirely and avoiding congested roadways,” says Hodges. “This new section is a tremendous asset to our neighborhood and the broader community. 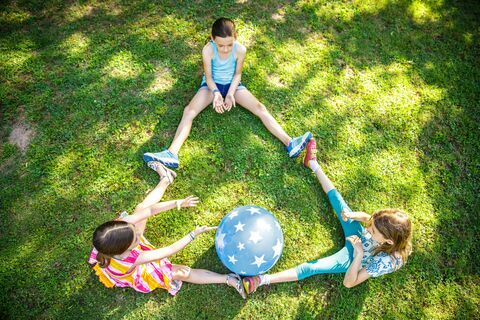 The connectivity among urban, suburban, and natural outdoor spaces is truly remarkable." The latest addition leaves just three miles left to go in the full South Chickamauga Greenway. When it's complete, Chattanoogans and visitors will enjoy a 23-mile car-free corridor linking the city proper with outlying neighborhoods and open space as far south as the 200-acre park at Camp Jordan. That means a world of options for outdoor recreation: walking, running, biking—even paddling on the creek from one the greenway's four canoe launches. The greenway system also has a practical side: Chattanoogans can use it to walk or bike to work or school—and avoid rush-hour traffic. For a city with ambitious climate-change goals, greenways are a critical part of the effort to reduce the number of cars on the road. Want to support work like this? We're working to connect communities to nature all across the country—and now is a great time to help out. When you donate to The Trust for Public Land before May 31, a generous supporter will match your gift dollar for dollar, up to $200,000. Good morning. Wonderful website, such beautiful work on these walkways. My question is if I have 4 acres on Youngstown Rd and it borders Chickamauga Creek does that make my property more valuable as the continuing walkway seems to be moving towards me? What is the proper name of the beautiful trees with red berries- are they a type of holly? Small Electric scooters ok on the Riverwalk? With max speed of 25-30 mph? Apx the weight of a bicycle? Hi Evelyn, The Trust for Public Land works with local agencies like parks departments to acquire and protect land for parks, but we do not manage the land. Please contact your local parks department for rules and regulations for visiting the Riverwalk. Thanks! Please do not bring that contraption to the Riverwalk. 25-30mph is way, WAY too fast for a multiuse trail where kids walk and ride their bikes all over. The RW is a non-motorized trail and what you have is basically a motorcycle.